Holistic SEO is a term used to describe development in which content, marketing, technical SEO, performance, security, user experience and user intent come together to create an ideal url on the internet, about a certain topic. Many factors are calculated by each search engine's algorithm to rank websites. SEO is no longer a few tricks done on or off site. Proper SEO, one with a Holistic approach, should be factored into absolutely every aspect of business goals, content strategy, development, site building, theming, content creation, and content marketing. For years, search engines and good SEO consultants told webmasters that creating good content is better than focusing on SEO trickery. With every Google update this becomes more and more relevant, as you can see results moved away from being specifically keyword focused, to results more defined by user intent, user location, and popularity. While some content disappears from the search engine results, others remain, and even thrive. The most common search engine ranking factors, and how to keep up to date. An overview of Content strategy and how it can guide development. Jim Birch is a Strategist at Xeno Media, Inc who specializes in planning, architecting, and developing digital projects for the world's best clients. 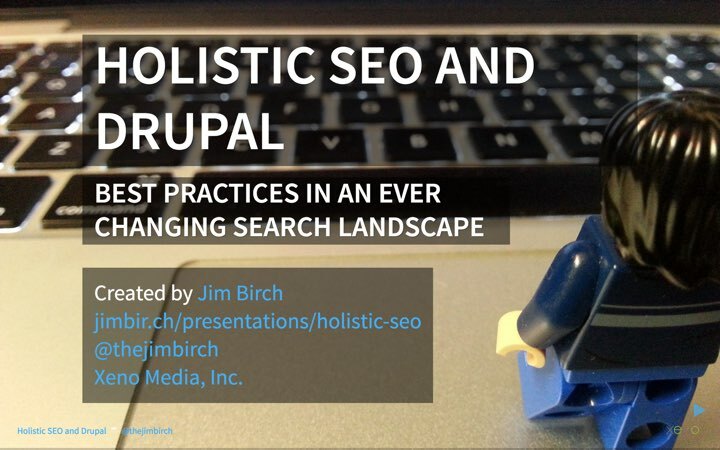 Jim is a seasoned technology speaker who has presented sessions at NYCcamp/Open Camps at the United Nations, WordCamp Chicago, Bay Area Drupal Camp (BADcamp), Twin Cities Drupal Camp, DrupalCorn and many Chicago area meetups.